Ce Manoir de 500 m² profite d'une situation exceptionnelle, à proximité des bains thermaux de Lavey-les-bains et offre une vue splendide entre les Dents de Morcles et la Cime-Est des Dents du Midi. 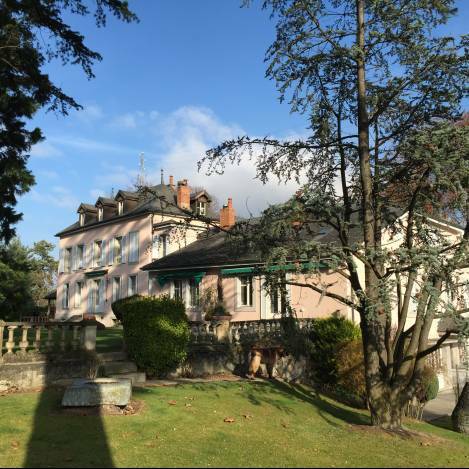 This 500 m² manor enjoys an exceptional location, close to the thermal baths of Lavey-les-Bains and with a magnificent view of the Dents de Morcles and the Cime de l'Est peaks of the Dents-du-Midi mountains. Built in 1870 in the heart of a five-hectare park lined with ancient chestnut and cedar trees, the property is extremely well-maintained. The residence is comprised of a main building (manor) as well as an annex with a separate entrance and an independent service apartment. It is spacious and well-lit amid rural surroundings. The estate is completely enclosed and boasts top quality facilities. An interior stable yard is home to six horse stalls, a drying room and a grooming room. A track and four summer stalls are located at the rear of the estate. An indoor arena (20/40) adjoins an outdoor Olympic-size arena (20/60) surrounded by meadows (four sand and four grass parks). A four-car garage and an unheated indoor swimming pool complete this magnificent property, ideal for nature and horse lovers.